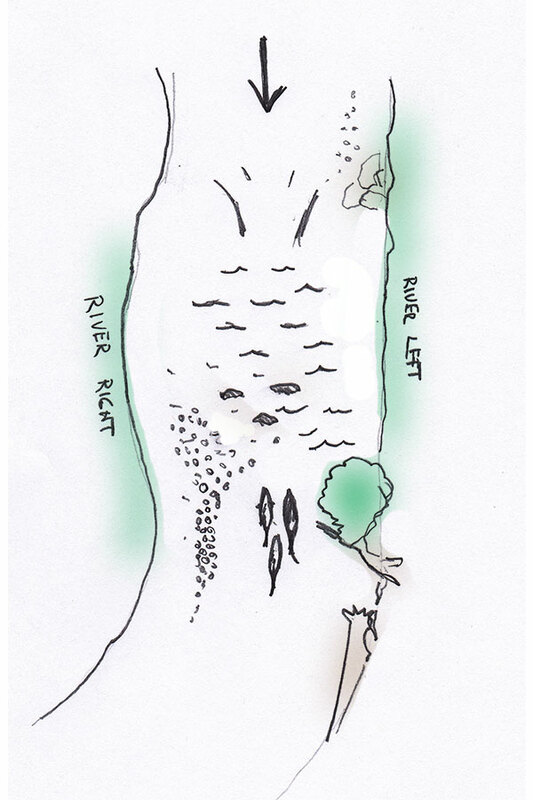 Skinny Water Steelhead – Swing Control and Direction. Swinging a fly on skinny water presents the down and across angler with a myriad of technical challenges. Like larger rivers, runs, pools and riffles occur through these small waters however, by virtue of the stream size, current speeds and transitions occur in small, compact spaces. While fishing a popular Wisconsin tributary recently I ran into a situation that is not uncommon on small waters. It was early in the steelhead run and fish were traveling. Throughout the morning I witnessed fish darting through shallow riffle areas as they pushed upstream. Based on that activity I decided that tailouts, heads of pools and pinch points on the river would provide the best opportunity — so I concentrated my efforts in those areas. 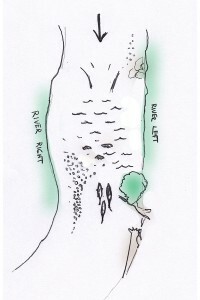 The river in this particular area (illustrated below) was no more than 30-feet wide. Water was low and the riffle area was running 1-ft to a 2- ft deep and quickly spilled into a 5-ft hole in the head of the next pool – where fish sit close to the lip, awaiting that moment to flee through the riffles. From a position at the head of the riffle on river right, I knew simply casting across to the deeper water on a short sink tip, I’d simply swing the fly over the heads of those holding fish. Had it been late in the fall, I wouldn’t have cared. 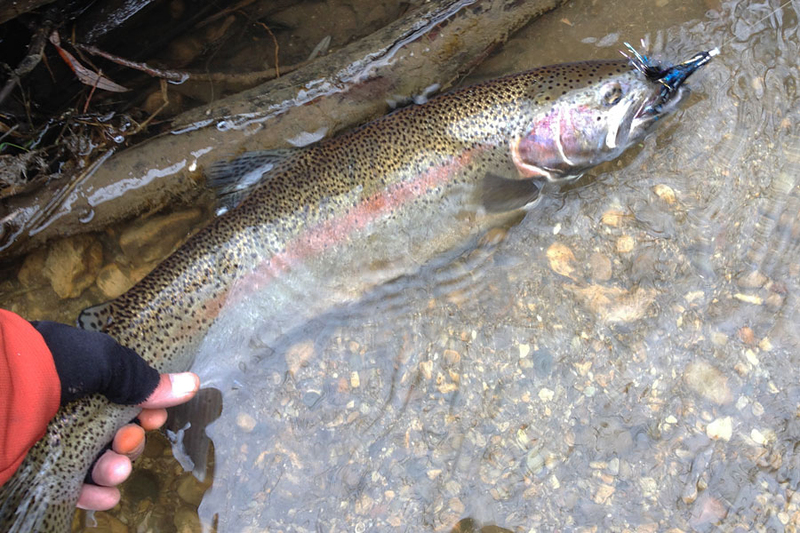 A fall steelhead will come up and ambush a fly but it was spring and the fly needed to smack them in the face. Ideally I needed the sink tip to get near the bottom of the riffles in a very short amount of time and position a heavily weighted fly that was bouncing over the bottom in away that it could drop over the ledge and fall in the hole – and let it briefly hang there before the faster surface current swept it away. If that wasn’t difficult enough, the riffle area was dotted with a number of large rocks that would obstruct a clean swing. I experimented with a variety of tips and after a few unsuccessful swings decided that presenting the fly from river right just wasn’t going to accomplish my goals. While the bank on river left was nearly vertical and covered with trees and shrubs, those casting problems were easier to overcome than my presentation problems. The high gravel bar just before the hole on river right had softer water and I’d hoped it would set up the drop of the fly. I switched to a 3.5-ft T-11 tip, shortened my leader to 5-ft in length and tied on the heaviest dumbbell-eyed fly I had (which also had a lead-wrapped shank). Three swings later, fish on. During the course of the day, I revisited the head of that pool three more times after resting it and it produced two more fish. Every Swing is Unique (especially on skinny water). There is no single sink tip, leader length and fly combination that will work in every circumstance. Be willing to adjust your gear for the moment. Don’t limit your tackle. Sink tips in varying length and sink rates provide opportunity to properly present a fly. Loop connectors are designed for quick changes and these changes can be the difference between a presentation that catches fish, and one that does not. Vary the weight in your flies. I tie my most successful patterns with extreme weight variations. From single and double cones, to lead-wrapped shanks with dumbbell eyes. You never know how fast or how far you need to get down in the strike zone. Observe and deduce. An old angler once told me, “think more, cast less.” Thoroughly thinking through your presentation yields positive results. Change the direction of your swing. By virtue of wading opportunity, most anglers wade into soft shallow current and cast to deeper, faster water. When possible, by boat position or wading opportunity, swinging from shallow into deeper water can yield surprisingly pleasant results and increased control of swing speed and depth. April 15, 2015 in Fly Fishing Tactics.